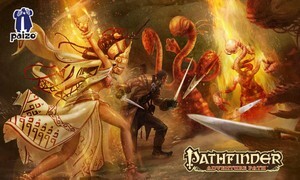 The "What grows within" SoundPack gives you the complete audio solution when playing the fifth chapter of Pathfinder's "Strange Aeons". All the preparation is done for you and every sound you'll need is right at your fingertips. Pathfinder Adventure Path: Strange Aeons, What Grows Within © 2017. Paizo Inc., the Paizo golem logo, Pathfinder, and Pathfinder Adventure Path are trademarks of Paizo Inc. Author: James Jacobs. SoundSet © 2016. Sounds created under license with Paizo Inc.